Whether you need repair services or a quote for a brand new high-efficiency air conditioning system, our certified technicians and comfort specialists are here to assist you. Our focus is 100% customer satisfaction. It drives every aspect of our AC business. Our expert AC technicians will accurately diagnose and repair your air conditioner. We service any make or model air conditioning system. Our repairs will be done on time, on budget and fixed right the first time. If it’s that time to replace your old AC with a new, high efficiency air conditioner, trust the pros at Majestic AC to determine the best system for your lifestyle and your budget. Our Crown Club membership will keep your air conditioner working at peak efficiency with an annual tune-up from from our expert technicians. Annual preventative maintenance prolongs the life of your HVAC system. With our Crown Club Membership, we will provide a complete precision tune-up and professional cleaning either annually or semi-annually, depending on the agreement for your heating and air conditioning equipment. SAVE 10% by signing up online today! Our Crown Club Memberships are very affordable and for the long-term benefits, a very smart choice. For a home with one unit, we provide two (2) semi-annual precision tune-ups for only $129 for one year. For homes with two units, the cost is $229 for one year. To take advantage of this program, please contact Majestic Air Conditioning and speak to one of our comfort specialists. When it comes to air conditioning, heating and indoor air quality, Majestic AC provides the best service and HVAC equipment available. From knowledgeable comfort specialists that can help you find the best AC system for you and your family to licensed technicians that can fix anything that goes wrong, the professionals at Majestic AC will treat you like family and help keep you comfortable year round. Our Customer First focus is integrated in everything we do. Houston summers are unforgiving and it is a necessity that your home AC system work at peak efficiency. Our technicians are experts at diagnosing problems and fixing them the first time. Don’t rely on a fly-by-night service for your home comfort needs. The pros at Majestic AC will have your air conditioner repaired quickly and affordably. Plus we stand behind all of our repair, maintenance and installation services 100%. 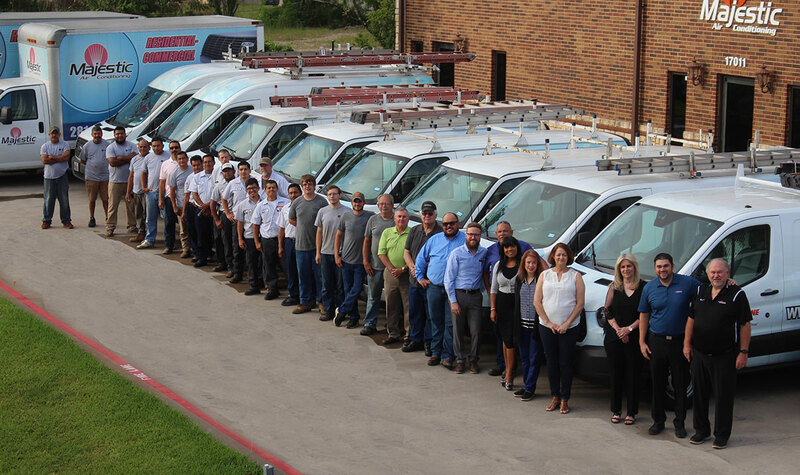 We have three generations of AC experience behind us and hundreds of loyal repeat customers. Give us the opportunity to show you what a true, professional AC service company can bring you in regards to peace of mind. Poor air quality may contribute to current or future health problems. Around Spring, Tomball and The Woodlands, you rarely need to run your heater but when temperatures drop they usually do so quickly. Because heaters are not used often, it is more important to maintain proper maintenance on them. The experts and Majestic AC can repair or service any make or model heater. We also install quality, brand name heaters and stand behind our equipment and workmanship with a 100% satisfaction guarantee. Don’t let a cold snap blindside you. Get your heater tuned up annually so that you will be ready. Get the latest info on home comfort including money-saving offers, one-time deals and specials. It's great working with honest, prompt and courteous people. Keep up the great work Majestic. Majestic is absolutely wonderful. Everyone is so courteous and knowledgable. I recommend them to anyone looking for heating and air conditioning service. We have used Majestic since building our home in 2008. Todd came on Saturday and replaced our fan motor. Really hot day for him in the attic, but he is a good representative of Majestic. Thanks for the cool air! I have enjoyed using Majestic for the past 10-years. They are prompt, courteous and skilled. Perhaps best of all, they are trustworthy. Y'all are life savers! Derrick is the best!!! Quick, affordable, and friendly! We've used Majestic for five years. The office is pleasant when she makes my appointment. They call to let us know when they are on their way and send a picture of technician to let us know who to expect. The technician is always prompt and covers his shoes so as to not track debris in the house. He does a thorough check up both in spring and fall and changes filters. Very pleasant company to do business with. You want quality and honesty then this is the company you want. Was having some issues getting my system register with Trane online so I called Majestic (as suggested by builder) and they handled everything for me. Deb took some basic information and filled out everything for us and followed up with email showing our system was registered with Trane. Everyone that I talked to at Majestic was polite and helpful. We have been using Majestic for a few years now. We have had an annual maintenance contract for spring and fall checks and service. Debbie in the service department is easy to work with and understands our needs. David, our technician, is a real gem. He is always on time, courteous, knowledgeable and really helps us with decisions. He doesn't try to upsell, but gives all the options. When we had a failure in A/C one, we scheduled service and then replacement. When A/C two failed, they moved up our replacements so that we were not dying of heat for 5 days. Thank you so much. I do recommend Majestic to my friends and I have one who is planning to move to them! David was on time, friendly and professional. Have used them for years ! Javier was wonderful! It took him no time to fix our heater. On the coldest days in December, he cheerfully brought our house temperature back to a livable condition. Will definitely use there service again. In the HVAC industry, we understand there are many choices. We work hard everyday making sure our customers know that they are the focus of our business. Great customer service starts with that first service call or estimate and never really ends. We offer some of the best air conditioning products in the industry in terms of reliability and durability as well as expert HVAC knowledge and experience. View our reviews in the following sites and you will see how we are uncompromising when it comes to our customers 100% satisfaction with our products and services.